It was OK. Not a great movie, not a terrible movie. It was just OK.
That's pretty much the only thing I could possibly say about this thing. I suppose I could mention some of the little easter eggs and mentions that I recognize as being culled from the old Expanded Universe (and seemed to be one of the few people among our group of buddies who knew what Teras Kasi was) and even note that one cameo towards the end of the film that everyone was talking about, but really, it was just an okay film. Stuff happened. Stuff that was touched on in lore was shown here. Everyone played their parts well. It was just... OK.
Oh, I guess I could say that the supposedly sassy droid who's all for robot rights or whatever was the low point of the movie. It feels forced in terms of the real-world social commentary that I don't care for in my movies unless it's done with care, its personality is just irritating as a whole, and comes off as the second coming of Jar Jar Binks. The only difference between the two characters - and this might be a spoiler, but I honestly don't care - is that Jar Jar Binks lived to see one more movie. And believe me; when that droid bit the dust, there were no tears shed on my part and I'll probably forget this droid a month or so later when I've got something better to watch. 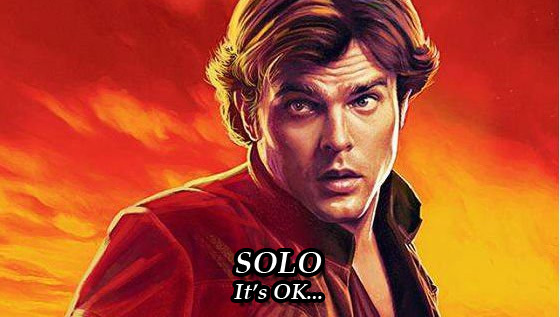 So that was Solo: A Star Wars Story. It was okay. Things happened. And it was a better movie than The Last Jedi. Not a particularly high bar, I admit, but it's something, at least. I do feel, however, that once we get Star Wars Episode IX: Why Bother out of the way, we should probably lay off the Star Wars movies for a while until there's a good story worth telling. Oh, and death to sassy droids. Sassy droids are the new Jar Jar Binks.